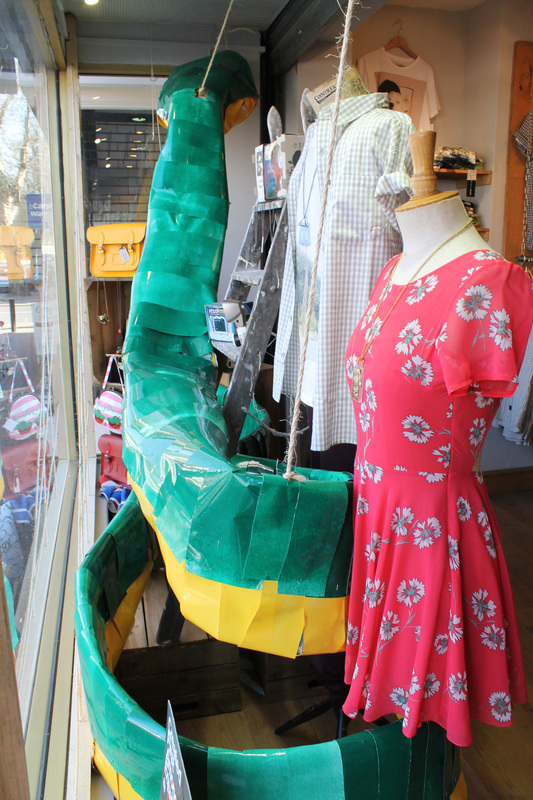 If you didn’t know already (shame on you) we invite a different local artist to dress our window each month. This month’s window has been up and scaring children since the start of the month but we’ve only just got around to writing about it! Busy times. If you’ve been knocking about Sheffield though you’ve probably already seen it. It’s fairly massive. Harry is a filmmaker in his spare time, and has made some excellent short films, check them out YEAH PROBABLY to see them, they’re brilliant! When we asked him about doing a window, we thought he’d do a film, maybe a projection… We were not expecting a huge installation with snakes and ladders! But it’s all good – we love it. 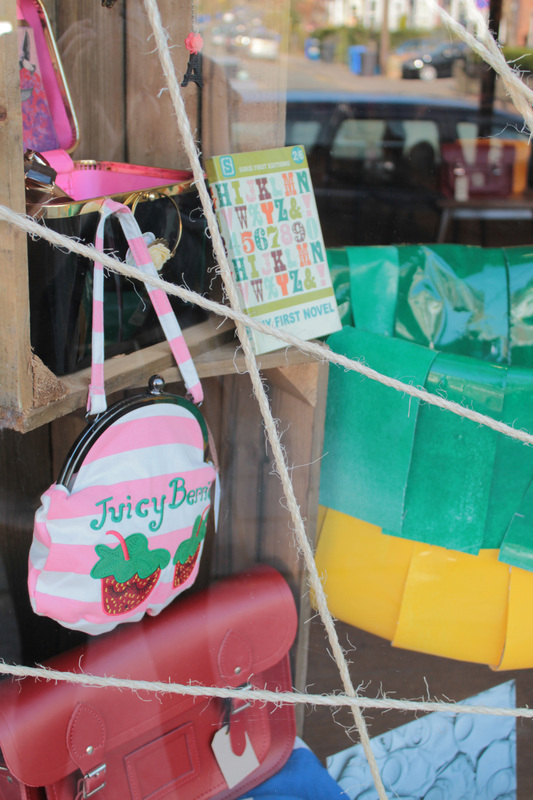 Beyond the web of rope is a Sukie notebook, a Kate Garey “Juicy Berries” clutch bag and a red Cambridge Satchel – lovely Summer stock. Then we have the ladders to complete the ‘Snakes & Ladders’ theme! Excellent stuff don’t you think? We’ve also kept our Mike (yes, we name our mannequins) looking cool in that KR3W Robinson check short sleeve shirt and Blood is the New Black t-shirt. *New label alert* on the necklace around his neck by Brutal Jewellery. 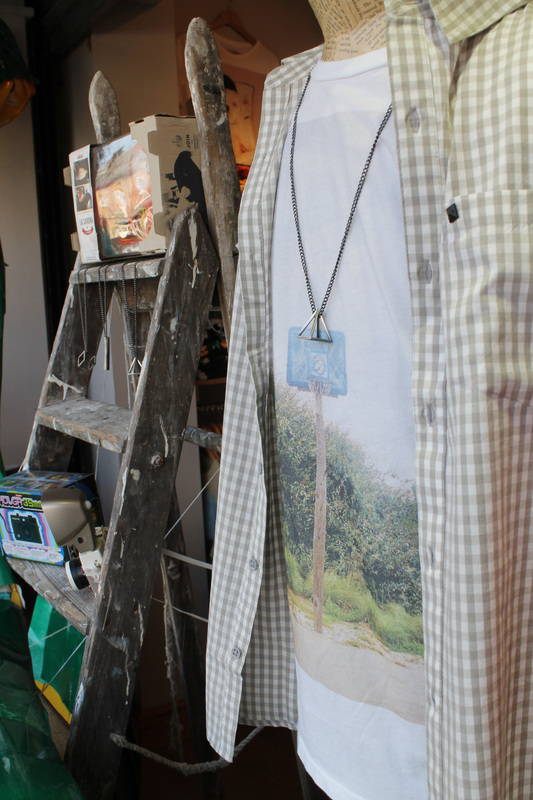 We’ve got more photos over on the Kuji Shop facebook page, go and have a gander! This entry was posted in Window Displays and tagged art, Blood is the New Black, Brutal Jewellery, cambridge satchel, clothing, design, fashion, Harry Clarke, kr3w, kujishop.co.uk, menswear, Sheffield, style, window display, womenswear. Bookmark the permalink. !?!? WOW! Love the “chutes & ladders” them, but where was the dice?! ?